The family of ULFA Commander-in-Chief Paresh Baruah or Anup Chetia aren’t interested to return to Assam as claimed by former Union Home Secretary G K Pillai. A close aid source of Paresh Baruah told Times of Assam that, G K Pillai was carrying a lie to create misunderstanding about Paresh Baruah among the Assamese people. The source also confirmed that couple of months ago, two ULFA leaders of Pro-Talk faction went to Bangladesh to manage jailed Anupa Chetia and take back Mithinga Daimary’s nephew Bhaskar Das alias Anik Khan Ringlee. Being aware about Pro-Talk ULFA leaders and cadres’ hide out from Bangladesh, Anup Chetia rejected the proposal of the duo who represented Arabinda Rajkhowa’s will to bring back Anup Chetia for lateral talk. Even nephew of Mithinga Daimary, Bhaskar Das who is now 17 years old and known as Anik Khan Ringlee in Bangladesh, also rejected to come back to Assam. Bhaskar Das alias Anik Khan Ringlee(who lost his parents along with grandparents and aunty, on August 13, 1998) slammed the Pro-Talk leaders for compromising with the enemies who killed his parents, the source also said. Bhaskar also questioned about the existence of any valid cause of his return to native place, which was un-answered by the duo ULFA(Pro-Talk) leaders. According to the source, the family of Anup Chetia also declined any interest to return to Assam as Chetia is jailed in Rajshahi Special Jail of Bangladesh. Chetia’s son Sagar Islam, who is 21 years old now, and daughter Banya Akhter (aged 16 years) expressed their interest on studies instead of following any request of the Pro-Talk ULFA leaders. Due to the rigid stand of Paresh Baruah’s wife Boby Bhuyan Baruah, the duo Pro-Talk leaders weren’t able to try to convince her to return. It is known from sources that Paresh Baruah’s elder son Tahsan Ankur Khan Sunlee(aged 20 years old), who is known by Babu as the nickname, is mixed up with Bangladeshi youth and use to play basketball for a Dhaka based youth team. 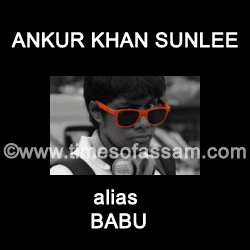 Known from the sources that Indian Intelligence collected several photographs of Ankur Khan Sunlee in recent days and tracked him totally so that following him Indian Intelligence can trace Paresh Baruah.